Chicken fajitas make a really easy dinner and the toppings can be tailored according to who is eating and what is in the fridge. Heat the oven to 120C/100C Fan/Gas ½. Wrap the tortillas in kitchen foil, place on a baking tray and warm in the oven until ready to use. Put the chicken in a bowl with the garlic, cumin, chilli powder and lime juice. Season with salt and pepper and toss, rubbing the seasoning into the chicken. Set aside to marinate for 5 minutes. Heat 1 tablespoon of the oil in a frying pan over a high heat. Add the chicken strips and cook for 5 minutes, until cooked through, golden-brown and slightly catching on the edges. Add the remaining 1 tablespoon of oil to the pan, add the onion and peppers and fry for 5 minutes, or until almost soft. Increase the heat until the vegetables char slightly on the edges. 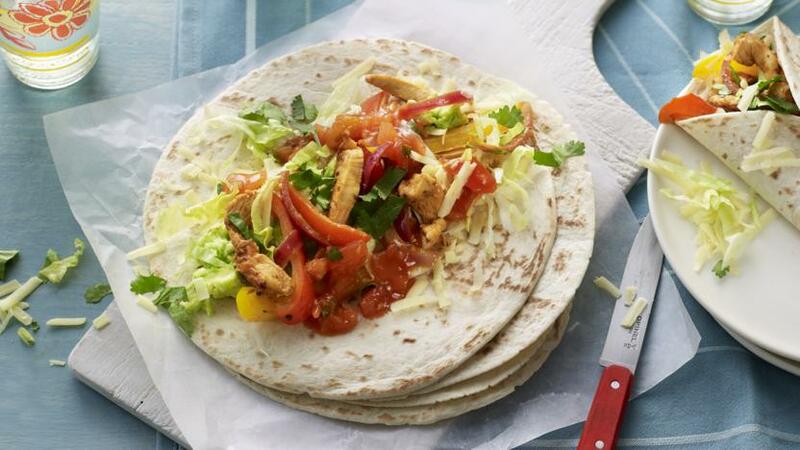 To assemble the fajitas, top the warmed tortillas with the chicken and vegetable mix. Top with your chosen toppings.